Sister Campbell is serving the IAM Western Territory as an Education Representative. She initiated into Phoenix, AZ Sky Harbor Lodge 2559 in November of 1988 and soon became extremely active, serving on multiple committees and in many different capacities. Sister Campbell served on her Local’s Legislative, Budget, Women’s, and Human Rights Committees, while also holding various elected and appointed positions such as Trustee, Recording Secretary, Communicator, Educator, Vice President and President. 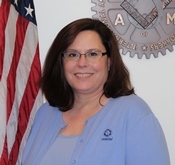 Campbell has also been extremely active with the Arizona State Council of Machinists, serving as a delegate in such positions as Auditor, Trustee, Vice President, Secretary/Treasurer and President.